National Assembly Chairman Nguyen Phu Trong has pointed to socio-economic achievements and difficulties in the first months of the year, calling for responsible, prudent and open discussions among NA deputies to find out appropriate solutions for sustainable development. 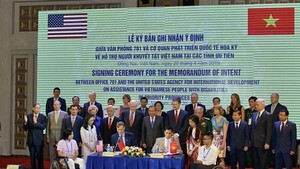 Chairman Trong was addressing the opening ceremony of the seventh session of the 12th National Assembly in Hanoi on May 20. He said the meeting took place in the context of regional and international economies on recovery after the global economic crisis. The country saw positive socio-economic developments in the first months of the year thanks to efforts of the Party, the NA, the business community and people, he stressed. These achievements, he said, would serve as a foundation for fulfilling the socio-economic targets of 2010, the final year of the 2006-2010 socio-economic development plan, contributing to the successful implementation of the 10th National Party Congress’ Resolution. 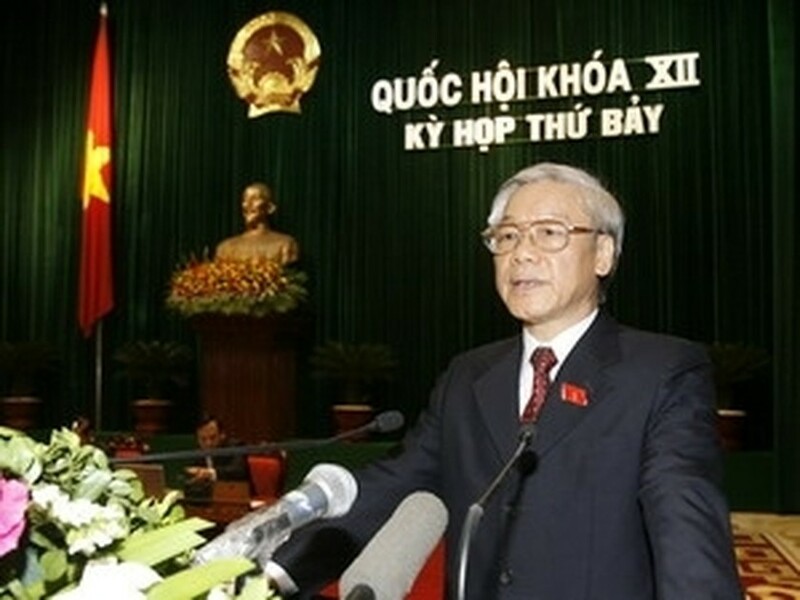 In his report on the implementation of the 2009 socio-economic tasks and state budget and the 2010 plan presented at the session, Deputy Prime Minister Nguyen Sinh Hung described the coordination of measures to stabilize macro-economy and curb inflation as top priority to fulfill the yearly plan and firmly recover the economy. It is necessary to sustain efforts to achieve major goals and targets of the whole year, focusing on obtaining the GDP growth rate of 6.5 percent, implementing the seventh Party Central Committee plenum’s Resolution on agriculture, farmer and rural area, Deputy PM Hung said. He also put stress on social security, rapid and sustainable poverty reduction, national defense, security and diplomacy, thus creating a peaceful, friendly and cooperative environment for national development. Attention should also be paid to acceleration of administrative reform, enhancement of management, information and education, creating a social consensus in the implementation of the 2010 tasks, the Deputy PM added. According to him, the country’s economy is on track of recovery in the first months of this year with an economic growth rate of 5.83 percent and inflation under control. The state budget collection reached nearly 159 trillion VND in the four-month period, equivalent to 34.4 percent of the yearly plan while the first quarter’s social investment rose 26.2 percent year-on-year. However, he pointed out weaknesses in macro-economy with modest increase of exports and a consumption price index increase of 4.27 percent in the first four months of the year. Hung, therefore, urged more efforts of all authorities, sector and the entire people for the achievement of the set targets. Also on the first day of their sitting, deputies heard a report on voters’ opinions, which focus on economy’s competitiveness, employment, land management, planning and natural resources, environment management, food hygiene as well as fight against corruption and waste. At this session, the NA deputies are expected to discuss and pass 10 bills and two draft resolutions, including the bill on banking and credit institutions (revised), the bill on housing and land tax, the bill on adoption, and the bill on trade arbitration. They will also give comments on six other bills. The deputies will also examine reports on investment in Hanoi-Ho Chi Minh express railway and the master plan on the construction of the capital city of Hanoi till 2030 and vision to 2050.